UN Habitat estimates that 1.6 billion people today live in inadequate shelter around the world, and 1 billion of those live in informal settlements or slums. An additional 100 million people worldwide are homeless. It goes on to state that by 2030, an additional 3 billion people or 40% of the world’s population, will need access to housing. This translates into a demand for 96,150 new affordable units every day and 4,000 every hour. By 2050, 70% of the world’s population is projected to be living in urban areas, causing slums and unplanned settlements to swell. About one in four people on this planet, live in conditions that harm their health, safety, prosperity and opportunities. Estimates of homelessness in the richest country on earth, the United States, vary from 1.6 million to 3 million people. Most studies conclude that about one-third of the homeless are children. In one of the most popular posts on this blog – Dimensions of Urban Poverty – it was pointed out that urban poverty had many dimensions such as income, education, health, housing and security… and alleviation of urban poverty can only happen if all these dimensions are addressed synchronously. That has not happened. While globalization may have put more money in the pockets of the urban poor (especially in the burgeoning and untaxed informal sector), the access of the urban poor to education and health remains questionable in both developed and developing economies, and of course, housing remains a major problem from Santiago to Shanghai. Rampant corruption in the housing sector, from the grant of building permissions, to undervaluation, to issuance of completion certificates, to housing loans and subsidies, to transactions under the table to avoid high registration fees and stamp duty. Clearly, inadequate housing is the problem. Not inadequate income. Not to mention that in an India increasingly riven by social unrest, insecurity and increasing violence against women, decent shelter makes for safe homes and neighborhoods that help to build social stability and security. 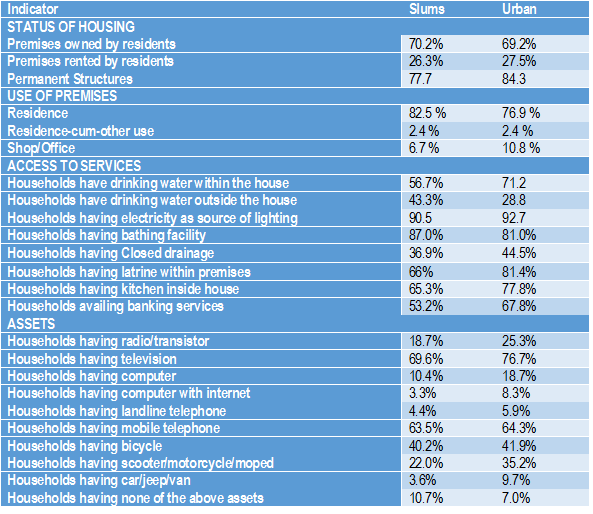 Apt corelation of housing and dimensions of urban poverty.